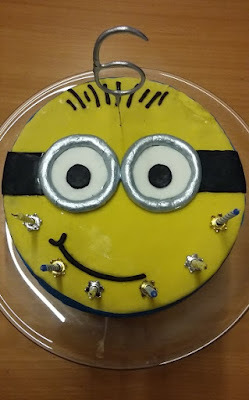 Minion birthday cake: dodgy icing, made with love. Much as I like baking, I find making cake for parties rather daunting. My standard favourite recipes involve minimal fuss, and even less icing, like Victoria sponge, lemon drizzle cake, marble cake, chocolate brownies and banana bread. The other common theme is that they taste best soon after coming out of the oven. Cakes for birthday parties however are a whole other ball game. They need to be cooked a day or two in advance and often to an unfeasible design dreamt up by a toddler’s twisted genius. Shirley Conran reckoned life is too short to stuff a mushroom. I reckon life is too short to wrestle with butter icing and a piping bag which is only slightly easier to handle than a recalcitrant octopus, and more prone to splitting (voice of bitter, if limited, experience). So when my children’s parties approach each year I rely on ready-to-roll fondant icing and Playdoh skills to roll, twist and squidge icing into something resembling a dinosaur, princess, pony or pirate ship. I look back on the treasure chest cake as a doddle (loaf tin, loads of haphazard chocolate icing, showered with smarties and chocolate coins) but shudder when remembering the mermaid with a terrible tail. Gravity was not kind. This year, my six-year-old requested a Minions cake, so I pretty much abandoned any attempt at 3D recreations and stuck to a flat face. I also wrestle with the cake underneath, because I feel one of life’s major disappointments is a spectacularly iced cake concealing the consistency of sawdust. I begrudge the expense of many supermarket cakes because they don’t even taste very nice. Having tried and failed over the years with various iterations of standard sponge cake (too dry after a couple of days out of the oven) madeira cake (tasteless and dry) and rich chocolate cake with extortionate quantities of dark chocolate and a lengthy recipe (devoured by the adults, rejected by the children) I recommend this chocolate cake instead. 300g Stork, plus extra for greasing the tins. Teaspoon or so of vodka to stick stuff together. Heat the oven to 170 degrees C or gas mark 3. Put a couple of 20cm round baking tins on some greaseproof / baking paper, and draw round the bases. Cut out the circles, grease the tins with a bit of extra butter or Stork, pop the paper circles in the bottom, and then grease the circles. It’s worth the faff for any hope of getting the cooked cakes out of the tins. I think the Mary Berry method is then to bung all the cake ingredients into a food processor, mix it up, and chuck it in the tins. The alternative is to cream together the Stork and sugar with a wooden spoon. Crack the eggs into a seperate bowl, stir in the vanilla essence and mix it together with a fork. Then sieve a bit of the flour and cocoa into the Stork and sugar mix, add some of the egg, and mix together. Repeat until you’ve added all the flour, cocoa and egg. However you make the cake mix, you then need to divide it between the two tins, use a knife to spread it flat, then cook in a preheated oven for 40-45 minutes. Faced with our elderly Aga, I put my cakes on a grid shelf on the bottom of the roasting oven, with the cold shelf on the lowest set of runners above it, then pray the cakes don’t rise so much they hit the cold shelf. Cooking is usually a bit quicker – 30 to 35 minutes. The cakes are done when you can tap the top of the cake and it sounds a bit hollow, rather than your finger making a bit of a depression, when a skewer or knife point stabbed in the centre comes out clean, and when the cakes have shrunk away from the edges of the tins slightly. Before icing, put one cake on top of another to see how much they wobble. Depending on how much your cakes have risen, you may have to cut off the tops of the cakes, so you have level surfaces to ice. Generally I try and get away with putting jam of whatever variety in the middle of a cake. For this chocolate birthday cake however I recommend making icing by melting the butter in a saucepan over a low heat, sieving in the cocoa powder, stirring together and cooking gently for a minute or so. Stir in the milk, seive in the icing sugar, then remove from the heat and mix to combine. Spread one of the cold cakes with the icing, then pop the other cake on top and leave to set. I can only tell you my haphazard and slap dash approach to icing, which has worked OK so far faced with undiscriminating under 10s. Some book I read recommended brushing apricot glaze over your sponge cake, so the fondant icing would stick to the cake. My version is to bung several tablespoons of cheap and cheerful apricot jam in a saucepan with a couple of tablespoons of water, heat it up, and stir it until the jam melts, combines with the water, and becomes a runnier consistency. I then spoon it on the cake and spread it out with a knife or pastry brush, avoiding or removing any lumps of apricot in the process. With the ready-to-roll icing, I sieve some icing sugar onto a big chopping board, use more icing sugar to dust a rolling pin, and then roll out the regal-ice to whatever shape is needed. One year in a fit of economy I just bought white fondant icing, and tried to colour it myself with food colouring. Never again. It took enormous quantities of colouring, masses of kneading, much swearing and still came out streaky. 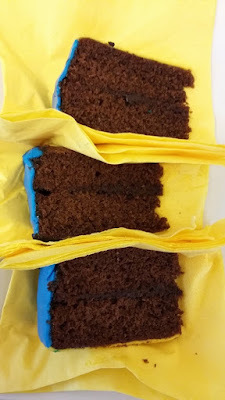 The Dr Oetker ready to roll Regal-Ice contains five 100g packets of coloured icing, which was just about enough to roll out a thin layer of yellow on top of the the cake and a thin layer of blue round the edge of the cake. NB It was worth doing the silver-painted goggles the day before cooking the cakes, so they had time to dry and set. There was plenty of black for the hair, mouth, goggle straps and eyes. I made sausages from the unloved green colour, shaped them into circles, and painted them with metallic silver edible food paint (joys of eBay). My husband got a bit worried when I produced a vodka bottle, but I’d ready somewhere else that vodka is useful to stick one bit of fondant icing to another, so I gave it a whirl. You can only use the tiniest amount anyway, if you don’t want the colours to run and smudge the top of the cake. Then end result looked a bit bodged together, but I attempted to distract the viewers by shoving on some candles and a sparkler. It was definitely recognised as a Minion by the birthday boy, which was what really counts. Anyone else wrestle with home made birthday cakes? Or prefer to avoid the hassle, and select from the supermarket shelves?